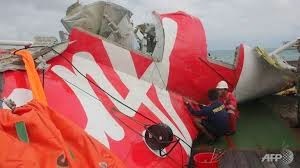 The National Search and Rescue Agency (BASARNAS) in Indonesia has successfully managed to lift the tail section of crashed AirAsia Flight QZ8501 from the Java Sea. The operation was helped by improved weather conditions and clear visibility in the search area over the past couple of days. While the operation continues to focus on the recovery of bodies, with 48 now removed from the sea, BASARNAS is confident its team are also close to recovering the two flight recorder boxes. In Surabaya, the Disaster Victim Identification (DVI) unit of the Indonesian police has announced the identity of a further three passengers. Efforts continue to identified 16 bodies of the 48 so far recovered. Searchers for the aircraft's debris are also confident that pings detected in recent days — close to the area where the tail of QZ8501 was recovered — are coming from at least one flight recorder. The so-called black box is believed to be wedged between or under pieces of wreckage still on the sea bed. Divers will attempt to extract the black box early on Monday morning if the weather and underwater visibility holds up.